We are a Pune based company engaged in making available CLC Blocks Making Machine. We offer CLC Blocks Making Machine of Chamunda Brand to our valued clients. 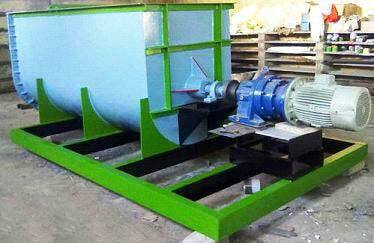 Our CLC Blocks Making Machine meet the diverse demands of the industries and are widely demanded. One can avail CLC Blocks Making Machine from us at market leading prices. Apart from this, we also provide Foam generator for CLC Blocks Making Machine and consultancy services for the usage and maintenance of CLC Blocks Making Machine. The amount of cement, sand (if included), water, fly-ash and foam included in the Light weight Cellular concrete mix design depends on the required properties (i.e. strength, thermal conductivity or durability). Also, depending on the required CLC density and variance, an appropriate mixer is selected. The hardened material consists of small-enclosed air bubbles thereby resulting in a light weight stable cellular material with densities ranging from as low 300kg/m3 to 1800Kg/m3. Good Curing gives strength and dimensional stability to Bricks. Bricks are cured either by air curing or high-pressure steam curing procedure. Because of great-engineered properties, Chamunda Cellular Lightweight Concrete Bricks have become popular in wide range of applications in construction sector.